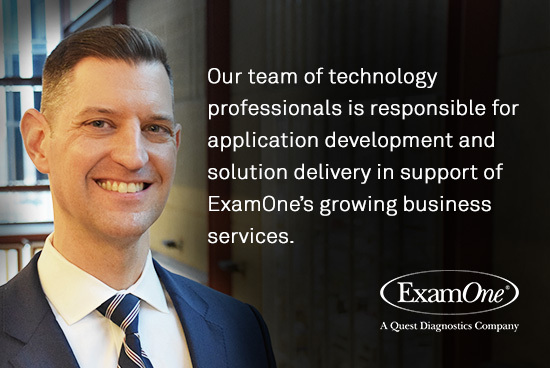 Eric leads a team of technology professionals responsible for application development and solution delivery in support of ExamOne’s growing business services. He works across the ExamOne divisions as an innovation-focused servant leader, ensuring technology solutions fulfill business requirements and meet customer needs. Prior to assuming responsibility for the ExamOne technology teams in 2017, Eric led several projects and teams for the Quest Diagnostics wellness division. Under his leadership, the teams delivered a suite of consumer-facing wellness applications, including a responsive portal providing online health risk assessments, screening scheduling, and wellness reports, as well as a tablet application used to streamline the on-site wellness screening events. Eric was also an integral team member in the successful integration of the Summit Health acquisition. Prior to joining Quest Diagnostics in 2010, Eric held software development and leadership roles for the largest corporate credit union in the United States, delivering technology solutions to provide mission critical payment services for credit unions across the country. Eric graduated from Missouri State University with a Bachelor of Science degree in Computer Information Systems. He resides in Kansas City, Missouri and enjoys spending free time supporting local charities and traveling with his wife.